Problem: Division of a Fortune 500 firm grew from 8 to 80 people within two years. 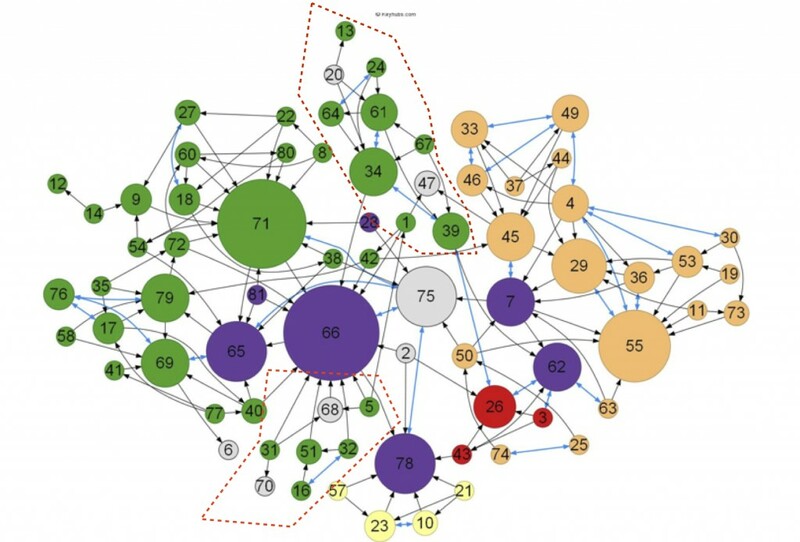 Spread across the globe, the department head was concerned that some teams were at-risk of feeling disconnected from the rest of the organization. Keyhubs Challenge: Uncover the informal dynamics of this global team in an attempt to strengthen collaboration and boost ties across geographical regions. What We Did: We designed a custom survey that looked at uncovering the relationship dynamics across functional teams and geographical locations. Super-fluid knowledge flow is key to successful execution of division objectives and these Keyhubs diagrams quickly pointed to the source of hidden bottlenecks. 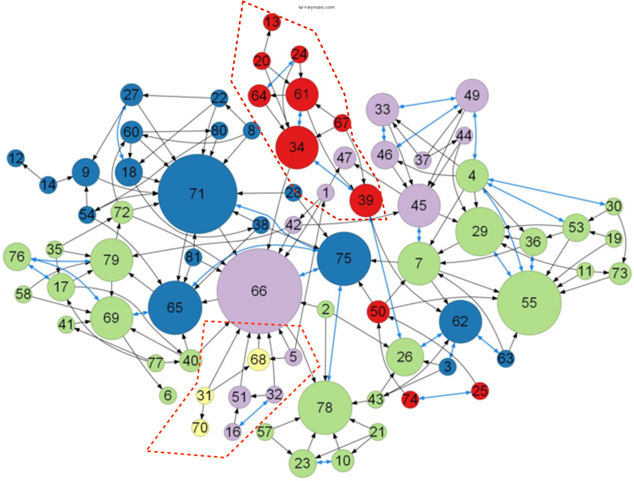 When we look at the Knowledge Network by function (each color below represents a different function), we see that two sub-groups, within the green team (highlighted by red dotted shape), are siloed from the larger network of green team members. As we dig deeper and overlay colors based on geographical regions, we learn that this silo effect appears to be due to geographical dispersion of the team. This apparent breakdown in knowledge flow was a key insight for the division head. The Keyhubs evaluation also uncovered dynamics with respect to mentorship, cross-continent communication and friendship. Result: With this information, the client was able to intentionally form a cross-geographical team to help bridge the “silo” effect and quicken / enhance collaboration.